UPDATE!!! Arturo will not be allowed to leave for the Canadian Polar Bear Sanctuary has been the recent statement this past September. 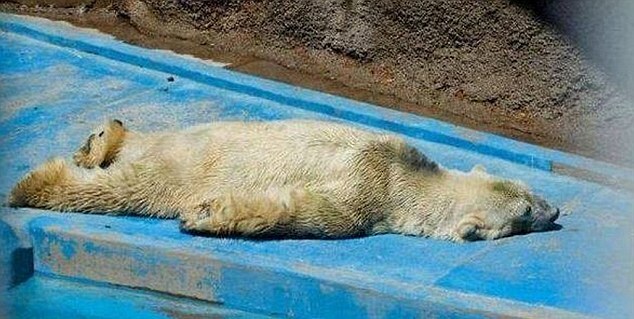 Latest photo of overheated Polar Bear Arturo! This is the culmination archetype of Greed in humanity, at it’s worse! Arturo is the primary attraction for the Mendoza Zoo; this means most moneys paid per capita are spent to see a Suffering Polar Bear, Arturo. The million plus signatures on recent petitions have been ignored! His diet is substandard, barely equal to the needs of a Polar Bear (read below the requirements). His living habitat is desert heat up to 104 degrees. How he has lived for 20 years of his 28 years here is beyond comprehension. In most recent statement, the Mendoza zoo has no intentions of keeping Arturo in any venue of compliance to the necessities for a Polar Bear, given Winnipeg Polar Bear Sanctuary has offered to give him a home. They have admitted to having nor medical records, which by all administrative rulings, exotic animals require certain medical examinations per year. Arturo is suffering. Review the photos below, and explanations of my research. WE need help from PETA and GREENPEACE! NOW. Over a million signatures were authenticated and DENIED by the officials of Mendoza, Argentina zoo. What next? 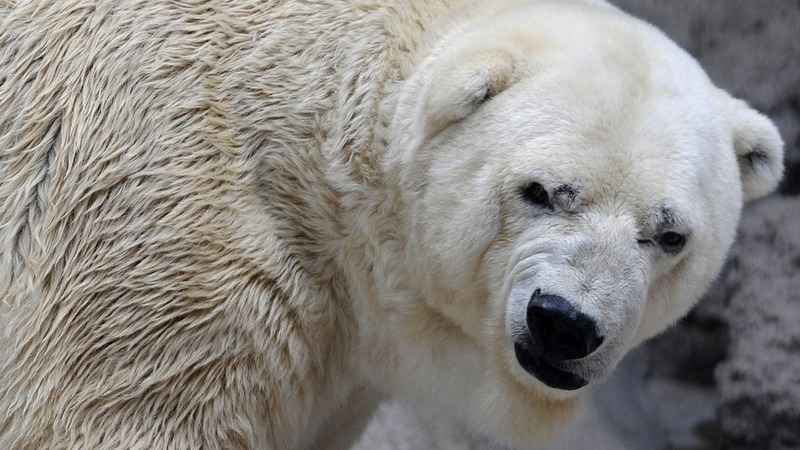 Arturo the Polar bear, has been inhumanly kept at the Mendoza zoo, in Argentina. He is in crucial stages and must be removed at once to a conducive environment that was offered by Canada. Raju the elephant is in legal arbitration to keep him from his last scurrilous owner, who illegally acquired the orphaned elephant; keeping Raju in the most barbarous of conditions. Recently I was sent this photo of my beloved (kindred spirit), the tigers. 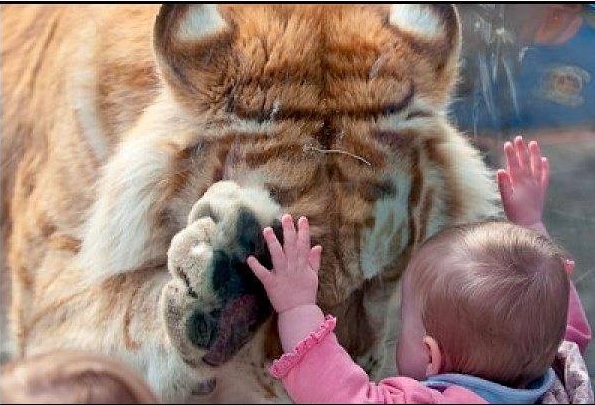 This displays an innocent child connecting through thick glass to the Siberian tiger; a most profound moment. Unfortunately to my disposition and love of Wild Tigers, the photo only served as a reminder of Mankind’s Beastly ways and brought me to an hour of weeping tears. My first thought was: why do we cage these beautiful wild beauties, for they never harmed our world? Where humans have committed atrocities; to other humans, animals and our planet and yet human perpetrators roam free and continue to destroy. My heart bleeds when viewing this picture! It is a moment in time when we can state there is an uncommon communication between human and Wild Beauty. Are we anthropomorphizing? Many reputable zoos research at length for the needs of their captive wild animals. Their teams are dedicated in replicating their environment, food – nutrition, and critical observation in behavior. Unfortunately we have the Beastly Mankind, whose only intent is greed, manifesting in egregious opprobrious – fortune seeking, at the expense of Wild Beauty. Here are two current stories in today’s headlines. Arturo, a 28 Polar Bear is a dire example. Acutely suffering, following the loss of his twenty some year companion Pelusa, two years past. His living conditions are deplorable. Eating regulations are not according to a polar bear’s diet, and has for some time, displayed critical psychological behaviour disorders. It is blatantly apparent the Mendoza zoo is not willing to cooperate when told by experts, Arturo is in danger. He decays in searing desert heat up to 104F degrees with no respite of an adequate pool to dive and swim into, nor watered climbing facilities; all compounded by being alone. In the past five months of arbitration and chaos, an exacerbated uprising has generated Greenpeace and other petition gathers, employing people to sign for the stated following reasons. Mendoza zoo, rebuffed a generous offer from Assiniboine Park Zoo in Winnipeg, Canada, home to a new International Polar Bear Conservation Centre. A two day transport for Arturo to be properly housed in Polar bear environment, proper nutrition, and medical care, and to live with other Polar bears; all of these issues are a fundamental for Arturo’s continued wellbeing. Mendoza Zoo stymied the bid in February 2014, along with the transportation from the current hellish zoo, to the well-monitored Polar bear facility. Ignorant statements recorded from Mr. Pronotto stating: “We wish to avoid a big mistake.” Mr. Pronotto also proclaimed in the zoos defense: “The difficulties in obtaining import permits, 3 years of medical records which are not available.” Officials claiming they do not have medical documents, concluding Arturo is not receiving ongoing proper medical care. All documents are mandated to be kept in Zoo administration offices. Ironically, Mendoza Zoo relies on statements made from the Embassy of Argentina in London issued on behalf of the Government of Mendoza. London, in the UK being an ocean and several continents away from Argentina – South America. They claim: “The medical team that gathered in Mendoza advised against moving Arturo. The group, comprising veterinarians and specialists from Argentina, Uruguay and Canada (the latter via videoconference), determined at the time that the animal was in optimum conditions both physically and in terms of its behaviour, that the premises where it lives complies with all international standards and that, given its age, an imminent transfer would put his health at risk. With regard to Arturo’s enclosure, the medical committee of veterinary surgeons that convened in February stated that it meets international standards the guidelines of the US Association of Zoos and Aquariums (AZA). The committee had requested some improvements to the bear’s living space to give Arturo a better quality of life.” This letter continues further in verbose standards, however I found no construction conducted to agree with the Argentina Embassy of London comments. Arturo mental status is substantially deteriorating due to loss of his companion and deplorable living condition. The only cooler conditions offered by the zoo employees “Blocks of ice are thrown into his (wadding) swimming pool to keep him cool.” Stated correctly, the pool does not offer sufficient water to cover Arturo’s body. Further proving the ineffectual mentality and knowledge conducted by Mendoza zoo. 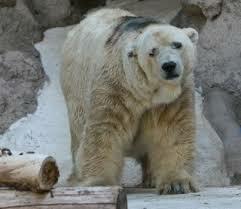 In further research I also found egregious contradictions in Arturo’s feeding and nutrition. Essential nutrition for Polar Bears: Polar bears feed mainly on ringed and bearded seals. Depending upon their location, they also eat harp and hooded seals and scavenge on carcasses of beluga whales, walruses, narwhals, and bowhead whales. Occasionally grazing on Bearberries, also known as kinnikinnick. 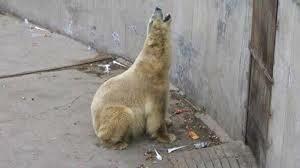 This photo is Arturo begging for his daily food, as the zoo personnel claim Arturo becomes aggressive when hungry and demands his food. This is stark contradiction to the above expert study of essential nutrition for Polar bears. Arturo has not been given a hibernation cave to escape to or adequate facilities of climbing rocks along with proper cool water pool to dive and exercise. Next, studies conducted of problematic behavior, indications of poor psychological well-being in captive wild animals, such as Arturo has been studied in depth by numerous scientist. Here are some notes from: NORA PHILBIN, Institute of Neurology, Queen Square, London WCIN 3BG. Arturo reported behaviour is critical: pacing, bouncing, spinning, head weaving, rocking, huddle, crouched – biting or head banging. A two day trip to Winnipeg Canada would and will prevent longer term suffering and gruesome death! 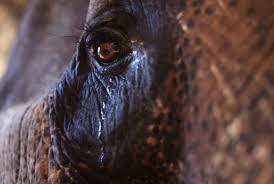 Raju the Weeping Elephant has swept the globe capturing the hearts and ears of many, greeting our eyes in horror. The SOS rescue team had grave concerns Raju would die soon, during the midnight deliverance Raju was fed fruit to keep him calm as SOS released him from his barbaric prison. SOS stated Raju was willing to board the truck with ease. 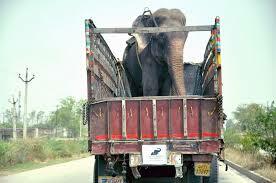 While still in spiked leg-irons, Raju visibly wept being loaded carefully onto his freedom truck. Some say it was gratitude for his freedom. 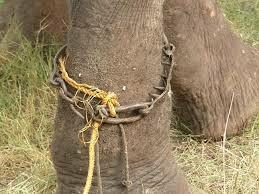 The barbarous spiked shackles clenching their way into his hide with every step, Raju remained reposed. The rescue expedition had to move quickly in order to extricate Raju from the nightmare he lived with yet another maligning owner Mr. Shahid. 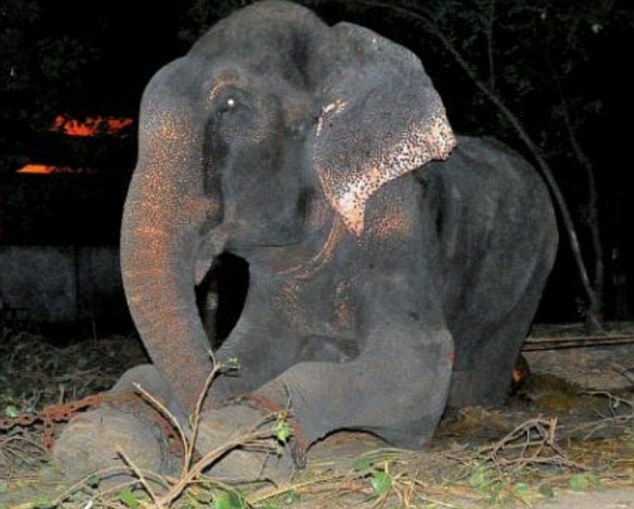 The SOS team stated, cutting the iron chains and shackles would take too long and his removal was imminent; the emancipation of Raju to safety was imperative. Raju being precariously close to starvation, there was no time to linger! Subsequently SOS would work without rest through the night to unbind Raja from his shackles. The process was proven to be long and painful exposing decrepitude infections, when removing Raju skin piercing spiked shackles left his legs bleeding. A doctor applied soothing ointment as Raju languish in assured safety. The abscesses riddled his legs from the tarmac roads. 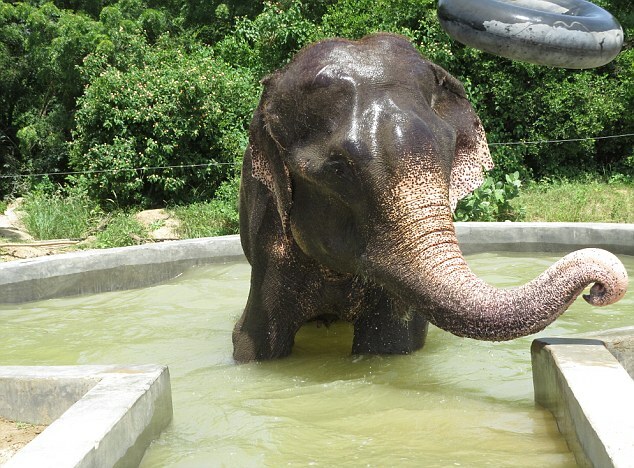 Raju sustained himself for over a decade begging for food, living on plastic food containers left by the throngs of sightseers. 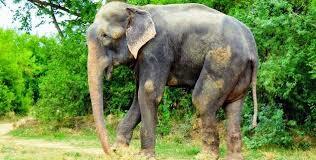 His owner Mr. Shahid, no longer fed Raju, nor bathed him, or concerns for Raju’s feet. Mr. Shahid continued to use crucifixion fashioned iron-legs leaving painfully abscesses through the years of captivity. These diabolical shackles forced Raju to sleep sitting up, never allowing full rest due to excruciating pain from the manacles. Now with arthritic joints which has exacerbated a serious limp, inclusive of his open wounds; Raju’s recovery will be long. Yet we see the joy of freedom in his eyes as he joins his new family, reveling in water sports to moisten his damaged hide. Having possibly over thirty owners over the fifty years of his life, excruciating torment never relinquished its cruel hand until 4th of July. He has had excellent medical care, proper food, hand bathed in clean water at the SOS sanctuary with other liberated elephants, most likely all orphaned by poachers and sold. A Hollywood producer, Larry Brezner is said to be teaming with Amritraj and his son Prakash to oversee the production of Raju’s story for an up and coming movie. It has also come to light Raju’s most recent owner Mr. Shahid, was charged for illegal custody of Raju in July 2013 by Ultar Pradesh Forest Dept. At this time there is an ugly battle waged in the courts filed by Mr. Shahid to obtain Raju for his continue covetousness greed. Post Note: This is my 50th Blog, I saw this blog as a statement. We have incredible ability as humans to make this planet exceptional, however what saturates us, are these atrocious deeds we humans continue to execute. We are on the threshold of transformation! I see a Global transformation via Clinton Global Initiative, Elon Musk in Space X, Tesla Cars, Solar City and he still continues. Nonprofit organization successes helping at risk children such as Dream School, a 30 day intensive through education. I meet many people who are driven with ardent determination to aid in mufti-fashions. From .50 cent donating extraordinary funds to help homeless children to aiding our soldiers coming home with PTSD & TBI – university studies with paramount break-through in treatment discoveries. Unfortunately, we still have the Beastly mankind that filters in our news and online. We cannot ignore these factors; we must continue to care and through this caring, ignite our passions for a Great New World, saving our planet, atmosphere, animal life and the proper consumption of real food for humans. The later is becoming a crisis point in birth defects and later life brain degenerative disorders, resulting in extreme medical costs. For every cause we give our time and education to, we grow in our humanity and there is more than hope; we triumph in Transforming our World. Beautifullly written. We must take care of our earth and ALL her creations. was great reading it. Look forward to other posts from you! God bless you for your contribution. A lifetime (I’m 65) of campaigning for all animals still leaves me dispairing of mankind. Arturo is always on my mind and breaks my heart. Shall continue to write to Embassy in London and pray for freedom for this dear bear. I hope all responsible will rot! You are more than welcome. I am busy till later this week, but am looking to send the blog article to the Huffington Post. You are also welcome to send excerpts the Huffington online as well, for they had an article on Raju the elephant published. Please keep spreading the article via whatever means, twitter, share with friends the blog post, on your FB. I truly do not see that the London Embassy has much to say such a long distance. Some might send the article to the Winnepeg Polar Bear conservatory also. He is being horribly treated and is showing many signs of deterioration. I put a great deal of time into my research and the more this is known, the more we are able to get him moved. I might also think of Greenpeace for they gathered 160,000 and counting signature. Thank you Robbie, you always have my back!